Dynafios 4CAST is the first tool we have used that provides both transparency and specificity, which will help us in standardizing and optimizing patient care, and reducing operational costs. Dynafios, a leading analytics and healthcare consulting company revolutionizing the business of healthcare, is pleased to announce that Willamette Valley Medical Center has chosen Dynafios 4CAST Analytics Platform to be implemented for all hospital service lines. Dynafios made the announcement while exhibiting at the International Stroke Conference in Los Angeles. Dynafios 4CAST is a comprehensive healthcare analytics tool that extracts, aggregates and transforms disparate data into easy to consume, actionable insights. 4CAST gives decision-makers the ability to identify key areas to enhance clinical outcomes and improve financial performance. Willamette Valley Medical Center, like other healthcare organizations, face pressure to standardize patient care and increase visibility into financial performance. Hospitals capture and prioritize huge volumes of data from disparate sources, formats and systems and manually organize the data. The data is constantly evolving, growing in complexity and volume making data management an untenable task. Dynafios will be demonstrating the power and ease of use of 4CAST Analytics Platform at the International Stroke Conference on January 24-25 at the Los Angeles Convention Center. To register, visit the ISC website. To learn more about Dynafios 4CAST, email info(at)dynafios(dot)com or visit http://www.dynafios.com/4CAST. Willamette Valley Medical Center is a for-profit Level III acute care hospital in McMinnville, Oregon. Originally established as McMinnville Hospital, this medical center has 80 licensed hospital beds and was named one of America’s Top Hospitals in by Mercer Health Care Provider Consulting and HCIA out of 3,400 hospitals nationwide. Willamette Valley Medical Center is part of RCCH Healthcare Partners, based in Brentwood, Tennessee. RCCH operates 17 regional health systems in 12 states. For more information on Willamette Valley Medical Center visit http://www.willamettevalleymedical.com or for more on RCCH Healthcare Partners visit http://www.RCCHHealth.com. Dynafios (http://www.dynafios.com) is a leading analytics and healthcare consulting company helping both hospitals and health systems become more successful in a dynamic and ever-changing environment. Dynafios software products include 4CAST Analytics Platform and TRACE, a mobile physician app and compliance tool. Health systems and leadership utilize the Dynafios 4CAST Analytics Platform and the TRACE app to work closely with providers in reducing variation, driving performance and elevating compliance. 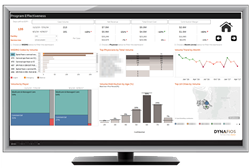 Visit us at http://www.dynafios.com, call 877.858.3282 or email info(at)dynafios(dot)com to learn more about our wide range of consulting services analytics tools and how we can help transform your organization.